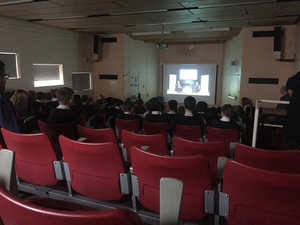 Some Year 9 students recently participated in the Holocaust Educational Trust’s live survivor webcast to mark Holocaust Memorial Day 2019. Students were able to put a human face to history and engage with one survivor’s personal experiences during the Holocaust. This year's webcast was an incredible opportunity to hear Harry Spiro's testimony, in the form of an interview with Robert Rinder. “Harry Spiro (a survivor of the Holocaust) aged 89 shared his terrifying experience on his journey of the Holocaust. Harry shared with us what it was like being moved into ghettos and Nazi camps, he also told us about what happened to his friends and family and how he worked his way through the trauma and pain.